It’s been a long time, about six months, since we drank an American wine. Our friends Jody and Tom, from Portland Oregon, left us a gift of a bottle of Lemelson Pinot Noir from the Wilamette Valley. I was always a fan of big, chewy wines, the kind of wines that are like a sensuous roll around on silk sheets; but spending time in Italy has made me appreciate the somewhat more austere taste of Italian wines. Think of the difference between hopping into bed with Marcello Mastroianni versus Marlon Brandon. Well, I have to say that getting reacquainted with the Marlon Brandon slice of life was a lot of fun. We set out a big table of cheeses, and wine and some delicious tartufo flavored salumi and talked about just how good the wine tasted. After a few months of ‘deprivation’ it was an eye opener to taste this style of wine again. There is an ongoing discussion in the wine world about how European wines are generally more food friendly than the big American and Australian wines. I do have to say that it would have been difficult to pair this wine with a simple meat based dinner. However, it paired beautifully with the big cheese and salumi flavors, and there was something about the different tastes on the table being anchored by this strong wine flavor that really worked, but in general it’s a challenging wine. And pairing wine and food IS challenging, when you get it right, the food just sings, when you get it wrong, you wind up with a sour taste in your mouth. Our latest cheese discovery is caciotta. It’s a young, smooth, relatively bland flavored cheese that can come from a cow, sheep or water buffalo, depending on which part of Italy you are in. Recently, we served it at the restaurant, melted, with black truffles and honey. This is a cheese that melts beautifully, it gets all brown and bubbly and acts like a neutral palette to play off of other flavors. Our favorite variation is to sprinkle some fennel flower pollen on the pieces before melting and then a bit of honey right as it comes out of the oven. 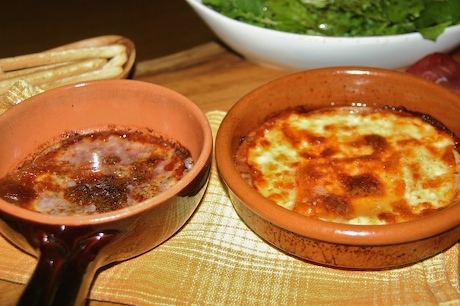 The caciotta on the left was flavored with oregano and some red wine, but it doesn’t hold a candle to the fennel variation. If you can track down some caciotta, this makes a great, quick meal, along with a salad. And it tastes great with some Pinot Noir! Thanks again, Jody and Tom! Having lived in Italy and Oregon for years, I don’t agree with your comment on this wine. 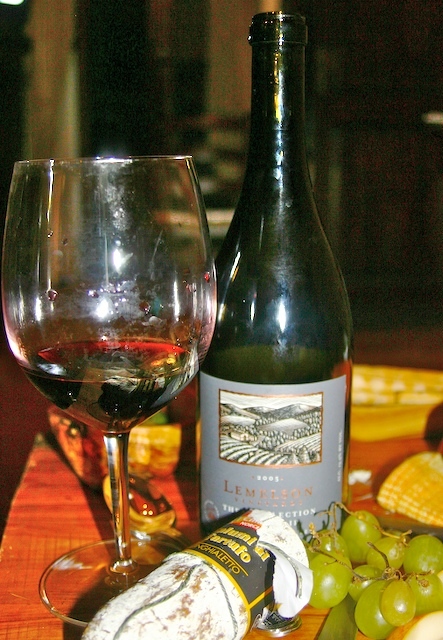 To say that the Lemelson is too big for meat and only related to cheese suggests and unclear reference by the taster to the nature of pinot noir. Even by Italian standards this is not on overly rich or oaky wine as it is clearly exceeded in these characteristics by many “new wave” Italian wines from Tuscany and the south. It should be pointed out there are no great Italian pinot noirs, only very good ones.